Hunter Singers was established in 1989 by Music Director, Kim Sutherland as the Hunter Region Department of Education Choir. The choir has had many highlights, including international tours, com- missioned works and wonderful concerts. Members of Hunter Singers have forged lifelong friendships and in November 2009, over 100 current and former members joined together for a phenomenal 20th Anniversary Concert. The atmosphere was electrifying as the wonderful sound of the singers filled Newcastle City Hall. 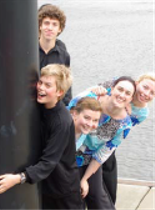 Hunter Singers is well known for its commitment to Australian music, with many commissioned works including Michael Atherton’s Inside the Storm, Stephen Leek’s work for choir and orchestra, Glasshouses, and works by Dan Walker, Gordon Hamilton, Rosalind Carlson, Wendy Ireland and Matthew Orlovich. Hunter Singers has performed with many outstanding artists including Afro Moses, Barry Manilow, Rhonda Burchmore, Newtown High School of Performing Arts Symphony Orchestra, the University of Newcastle Chamber Choir, Young Voices of Melbourne and The Australian Voices. Some members of Hunter Singers were also involved in a recording project with Daniel Johns and Paul Mac from The Dissociatives. Hunter Singers has released three compact discs – Kondalilla (2005), Hunter Singers: Carols and Songs (1996) and Hunter Singers: 10 Years (2000). The CD of the 20th Anniversary concert was released in 2010.